So am I going to hell for blasphemy? So how do i find out? Simple, I'm gonna ask you lot. 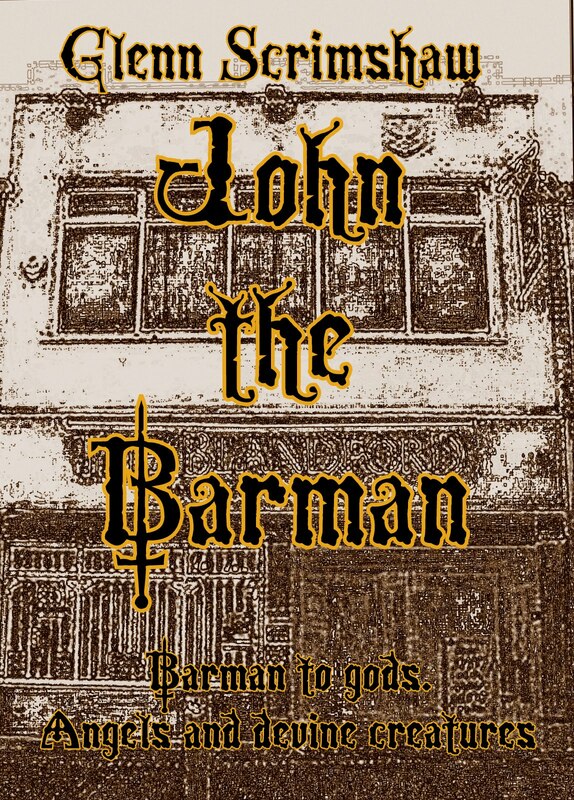 So here follows the part of JOHN THE BARMAN i'm unsure about. Is it light hearted comedy of am I going to hell for blasphemy. And before you jump all over me for grammer and stuff it hasn't been proofread or anything as it's still a work in progress. The bar was small, dark and twenty years the wrong side of needing decorating. It consisted of a single long room with one side dominated by the wooden bar while on the other side threadbare bench seats made up three horseshoe snugs. As usual behind the bar John was working, well he was reading a newspaper as he waited the day’s customers to turn up but he was classed as working. Working the mid-week dayshift was never what you could call difficult, unless you forgot something to read. You just had a handful of regulars with nowhere better to go or avoiding going where they had to go for a while. The bar was officially one step above a dive but that was the way the regulars liked it to be. It was a bar you could relax in that had a lived-in feeling and a friendly face to serve you drinks and bags of crisps. He kept the toilets relatively clean and there was usually toilet paper in the cubicles and the smell from the gents wasn’t too overpowering. On the other side of the stairs that led up to the entrance was an open space dominated by a pool table, the only item in the place that was kept in good condition. The windows on the far side of the table were large and dirty and let in just enough light to keep the place dingy. This suited the bar and hid much of the years of grime and also made the television picture on the projection screen, above the toilet doors at the opposite end of the room visible. The television was just used as background ambience when he turned it on, always tuned into one of the music channels that played mindless songs so it had the volume on mute almost constantly. John heard the first of his customers come stamping up the stairs and didn’t need to look up to know who it was. As his first customer sat down on a barstool before him John absently leaned over and grabbed a bottle of brown ale from the shelf next to his chair and flicked off the lid on the bar mounted bottle opener without looking. “Good night at the nut house?” John enquired placing the bottle on the bar, still not looking up from his newspaper. “I so hate my job, we had a load of new arrivals during the night and had a hell of a job finding accommodation for them all. I’m sure Peter is getting more choosey on who he lets in so sends them over to me as he can’t be bothered to do proper background checks.” The customer replied in a weary voice before taking a long drink from the bottle before him. “Anyone I would have heard of?” John asked finally looking up. “What is it?” Lucifer asked with interest. “Riverdance, and before you ask yes it’s Michael Flatley dancing the lead.” John said with a grin that was returned by Lucifer. “You’re a star, I loved this when it came out, cried my eyes out first time I saw it live.” Lucifer spun around on the stool to face the screen. John always spent time looking for anything to do with dancing if he went to a car boot sale or charity shop as he knew Lucifer loved dance. He had wanted to go to dance school but his Father had forbidden it. He had heard there had been a big fight that ended with Lucifer finally being forced to go and run hell. He was a nice guy but so misunderstood because of his job as head jailer for his Father. Finding a few DVDs was the least John could do to try and cheer the unhappy ex-angel up. Even now after all this time he was still upset at being forced to go into the family business. “Is your Father popping in later do you know?” John asked as he put the disc in the battered DVD player. “He should be, I think he wants to go over the budget. How he expects me to keep running things if I can’t employ more staff I don’t know.” Lucifer drained his drink and indicated with a shake of the empty bottle he wanted a fresh one. “So the trial on promoting some of the inmates to overseers didn’t work then?” John asked as he pressed play. John grabbed another bottle and after opening it placed in on the bar next to Lucifer who sat now bobbing his head with the start of the music. Grabbing himself a double whisky to banish the image of the burning mime artists he sat back down on his stool behind the bar and returned his attention to the paper. Riverdance was reaching its conclusion and Lucifer stood in the middle of the floor dancing along in perfect time as a couple of new customers walked up the stairs. John looked up as the first of two old men came into view. He put his arm out against the wall breathing heavily as he reached the top step. “Two beers John and whatever the old fart behind me wants.” He gasped then looked over at Lucifer and shook his head in disgust before continuing over to the bar. The second old man reached the top of the stairs and headed for a bar stool next to him also breathing heavily. 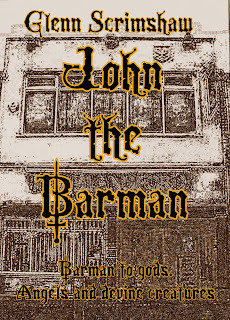 “Your usual?” John asked him as he placed the first pint on the bar and started pulling the second pint, the old man just nodded as he regained his breath. Both men had been heavily muscled in their youth but age had robbed them of their strength. John placed the second pint on the bar before grabbing a wine glass from a shelf above the bar and turning to the wine bottles he filled it with a cheap house red wine. “When you’re done pouring the girly drink can we have the pool cues, gonna teach this old fart a lesson in pool again.” The first old man said with a grin. John placed the wineglass down and turned to grab the cues from the corner where they were kept. “Daft old coot thinks he’s back in Midgard, if he’s got two brain cells working he’s having a good day.” Thor replied and finished off the first pint before accepting the pool cues that John passed over the bar to him. “Thor, hurry up it’s your break.” Shouted the other old man from up by the pool table. “Morning Lucifer.” He added more cheerfully. “Morning Hercules, how’s your back holding up?” Inquired Lucifer. “Sore as buggery, dam damp weather always makes it play up.” Hercules replied giving the small of his back a rub to illustrate his discomfort. “No catching the balls you two, how am I supposed to make any money if you only pay for one rack a day.” John warned them with a smile as Thor walked over to the table. John gave a look that showed that heroes or not he knew they always caught the balls and grabbed another bottle off the shelf for Lucifer. “It’s a shame about Odin.” Lucifer said as he accepted the bottle. “Age catches up with everyone eventually.” John replied sitting back down. “Except you.” Lucifer said with a smile. “Don’t know I felt my age this morning. Got talked into a lock-in by a couple of your lads last night, was as rough as a badgers arse this morning.” John replied with a grimace. “You shouldn’t let them talk you into lock-ins John, they’d keep you open round the clock if they had their way.” Lucifer answered. Lucifer sat watching the music channel that now played as he supped at another bottle. The sound for the television was muted as Thor had selected a string of rock tracks from the jukebox so some kid called Justin was presently appearing to sing ‘Enter Sandman’. All things considered with how just seeing him prance about on stage Lucifer was thankful the sound to the music video was switched off. Suddenly he felt a vibration in his pocket and reaching in and pulled out his mobile phone, pressing the screen he read the text message and groaned. John nodded in a non-committal sort of way as he placed the glass of whiskey on the bar and grabbed a glass for the lager top. By the time he had poured the drink they heard footsteps on the stairs and Gabriel walked in. He was wearing a postman’s uniform and dropped his bag by a stool. “Father will be up in a minute, he stopped to catch up with some tramp with a dog.” Gabriel picked up the larger top and took a sip. “So Lucifer, how’s work, keeping you busy?” He asked smugly. “Sod off delivery boy before I take that bag and ram it up where the sun doesn’t shine.” Lucifer replied angrily. “Lucifer! Be nice to your brother.” A voice said from the top of the stair, Lucifer sat up a little straighter on his stool but didn’t turn around. “So what did you tell him?” Lucifer asked. “I gave him a severe throat infection and told him if he has another drink it will fry his liver, then I gave him a few visions.” God said sitting down. “Sure it will, he ran off and got hit by a bus.” God replied. “Wasn’t that a little extreme, I’ve seen you leave here some nights singing at the top of your voice.” John asked aghast, Lucifer and Gabriel both nodded their agreement. “Well that’s something, who took the dog in?” John asked. “He wouldn’t… would he?” Gabriel said the colour draining from his face. God looked over at Thor and Hercules, Thor had a hand in a pocket on the pool table and as Hercules took the shot the red ball fell into his palm. Taking the ball he put it into the holding area for the balls on one end of the table. “Lucky shot.” He grumbled. “You should stop them doing that.” God observed. “I love X Factor, who is it?” Gabriel asked leaning forward. “As well as who?” God asked confused. “The gays I think.” Lucifer offered as he reached over and opened the paper to page three. “He’s trying Father but every time he turns around a wife has another D.I.Y. project or needs something from the shops.” Gabriel said defending Jesus. “Why how many wives does he have?” John asked. “Well imagine all the nuns for the last two thousand years and then remember that they are all the brides of Christ and you understand the lads suffering. The crucifixion was just the start of him suffering for humanities sins.” Lucifer replied hiding a smirk. “It was a joke, I didn’t realise it would be binding.” Lucifer replied trying to look innocent. Standing up with his drink in his hand God walked over to one of the snugs. Lucifer gave one last admiring look at the page three girl then followed god to sit down. Gabriel stayed at the bar sipping at his larger. “Gabriel, don’t be all day with that drink, I don’t want them letters delivering late.” God said over his shoulder. God and Lucifer talked for about twenty minutes before God left with a wave to John and the two old men still playing pool. “Nothing to do with me, not influenced any of that lot since the Nixon thing in the early seventies. It was a waste of resources as they are doing better without my help.” Lucifer answered shrugging his shoulders. “You mean they come up with that stuff on their own? Now that’s scary.” God said with a shake of his head and then headed down the stairs. Lucifer came up to the bar, a smile on his face as he ordered another drink. “You managed to get the extra funding then?” John asked. John paused as the mental image flashed across his mind, with a shudder he grabbed himself a glass and poured himself another double whisky. “I thought you wasn’t supposed to call people fat anymore?” John asked.